It was my third big trade fair. For the first two, there were still three of us and the roles were shared out: While my friend talked to customers and my son took care of everything of everything going on around, I painted a large picture at the stand. Now the new fair was beginning, and I was looking after my stand all alone. ‘It will always go down well, if people can see that your product motifs are painted by you yourself’: I took this advice to heart again and brought my painting materials to this fair too. 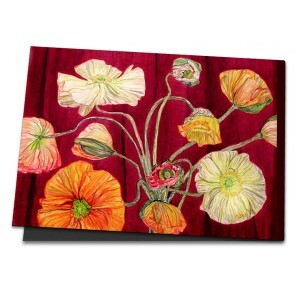 I placed an Iceland poppy in a large vase on the rostrum. The capsules quickly opened in the heated exhibition hall, broke away from their insides and unfurled into huge, spectacularly beautiful blooms, which harmonised perfectly with the wine-red background of my stall. I had a large sheet of watercolour paper and a thick brush, and yet despite this, I needed lots of time and attention for my picture. The further it developed, the more I lost interest in potential trade fair customers. But I needed to look sharp: the flowers only had a limited lifespan and they were swiftly wilting. At the end of the four-day fair, I had hardly any commissions, but I did have a strong painting and I’d had many good conversations – meetings of artistic minds. Only the exhibitors from the neighbouring stands looked over in wonder, it was a puzzle to them why my picture had become more important than selling. They’re not painters! I had now made the mistake of losing my chance of commercial success, but I vowed to improve for the next fair and encouragingly named my picture ‘Continua’: carry on!